The photo above, allegedly taken in Chile, shows Adolf Hitler when he was over 90 years old, he died in Mendoza Argentina in December 1985, where he had spent forty years after fleeing the Reich in 1945, protected by the local Sephardic Jewish community and the Nazi SS. Hitler was a grandson of Baron Salomon Mayer Rothschild of Vienna, he was buried in a public cemetery in Palmero, 30 Miles southeast of Mendoza, he completed many paintings. Hanna Reitsch landed her Fieseler Fi 156 Storch in the Tiergarten near the Brandenburg Gate, 26 April 1945, departing in a down wind take off 28 April, she had on board passengers Adolph Hitler and Eva Braun, whom she flew to Jugoslavia then under the military governorship of Sepp Deitrich head of the Waffen SS, where they remained until 1947 before taking regular sea passage to Argentina. Adolph Hitler: My political testament. More than thirty years have passed since 1914 when I made my modest contribution as a volunteer in the First World War, which was forced upon the Reich. In these three decades love and loyalty to my people have guided all my thoughts, actions and my life. They gave me the strength to make the most difficult decisions ever to confront mortal man. In these three decades I have spent my strength and my health. It is untrue that I or anyone else in Germany wanted war in 1939. It was wanted and provoked solely by international statesmen either of Jewish origin or working for Jewish interests. I have made too many offers for the limitation and control of armaments, which posterity will not be cowardly enough always to disregard, for responsibility for the outbreak of this war to be placed on me. Nor have I ever wished that, after the appalling First World War, there would ever be a second against either England or America. Centuries will go by, but from the ruins of our towns and monuments the hatred of those ultimately responsible will always grow anew against the people whom we have to thank for all this: international Jewry and its henchmen. I have left no one in doubt that if the people of Europe are once more treated as mere blocks of shares in the hands of these international money and finance conspirators, then the sole responsibility for the massacre must be borne by the true culprits: the Jews. Nor have I left anyone in doubt that this time millions of European children of Aryan descent will starve to death, millions of men will die in battle, and hundreds of thousands of women and children will be burned or bombed to death in our cities without the true culprits being held to account, albeit more humanely. I wish to share my fate with that which millions of others have also taken upon themselves by remaining in this city. Further, I shall not fall into the hands of the enemy who requires a new spectacle, presented by the Jews, for the diversion of the hysterical masses. That I am deeply grateful to them all is as self-evident as is my wish that they do not abandon the struggle but that, no matter where, they continue to fight the enemies of the Fatherland, faithful to the ideals of the great Clausewitz. Through the sacrifices of our soldiers and my own fellowship with them unto death, a seed has been sown in German history that will one day grow to usher in the glorious rebirth of the National Socialist movement in a truly united nation. Many of our bravest men and women have sworn to bind their lives to mine to the end. I have begged, and finally ordered, them not to do so but to play their part in the further struggle of the nation. I ask the leaders of the Army, the Navy and the Air Force to strengthen the National Socialist spirit of resistance of our soldiers by all possible means, with special emphasis on the fact that I myself, as the founder and creator of this movement, prefer death to cowardly resignation or even to capitulation. Although a number of these men, including Martin Bormann, Dr Goebbels and others together with their wives have joined me of their own free will, not wishing to leave the capital under any circumstances and prepared to die with me, I implore them to grant my request that they place the welfare of the nation above their own feelings. By their work and loyal companionship they will remain as close to me after my death as I hope my spirit will continue to dwell among them and accompany them always. Let them be severe but never unjust and let them never, above all, allow fear to preside over their actions, placing the honor of the nation above everything that exists on earth. May they, finally, always remember that our task, the consolidation of a National Socialist state, represents the work of centuries to come, so that every individual must subordinate his own interest to the common good. 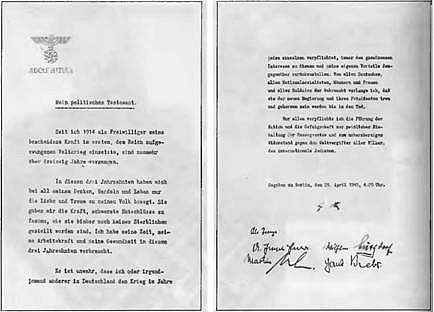 I ask of all Germans, of all National Socialists, men and women and all soldiers of the Wehrmacht, that they remain faithful and obedient unto death to the new government and its President. http://sitesofmemory.twoday.net/stories/4261731/ http://www.spiegel.de/international/germany/0,1518,491332,00.html .. of 30,000 Germans sentenced to death by Nazi Germany's military courts during the Second World War, more than 15,000 were executed for deserting the ranks of the Wehrmacht. Why didn't the Jews (Nazi hunters) come after them? Hitler and all of the senior Nazis were Jews, Ernst Rohm and the SA hierarchy the non Jewish Nazis, whose Zionist financed wickedness and thuggery brought H to power, were liquidated in the Night of the Long Knives Massacre of June 1934, after H was sworn in as German Chancellor January 31, 1933. The Leader and Reichschancelor Adolf Hitler. Reichsleader of the NSDAP Gregor Strasser. Field commanders Globocnik, called the Jewish destructor. Von Keudell II, all of whom were active in the destruction of Jews. The Communist / Bolshevik, movement completely devised and executed by Jewish master minds, or partly Jewish like Lenin, to full Jewish like so many of the Secret Police Chiefs, all the way to Marx & Trosky, as well the entire Nazi movement was Jew or half Jew! .. Dietrich Bronder was a German Jew. When you use quotes it is meant to quote another poster. Merely wrapping sentences in quote boxes doesn't tell us anything. So far your posts have very little clarity and are rather oblique. It would be nice if you state your position or perspective as it relates to the material you are posting. And you will find that this admin does not care to be ignored. I posted a response to your post here: http://www.freedomportal.net/forum/index.php/topic,25391.msg243565.html#msg243565 asking that you explain that particular post. I suggest you post an answer. Damn, this Martin Timothy opened up an awful lot of new threads over a short span of time. Threads I was not able to make heads or tails out of. Maybe it's just me. I am going to borrow heavily here from Metapedia to lay out the general story and then add the forensic evidence from various sources which seals the deal and should put “paid” to this persistent rubbish that floats around the Internet in conspiracy theory circles. “Hitler heroically had before the start of the second world war connected his personal fate with the outcome this war. Not only in words, but also in deeds: he committed suicide on April 30 1945, when the war was irrevocably lost. His suicide is also stated by authentic witnesses, who also lived in the Führerbunker, and it can therefore be considered as a fact of history. Despite this, rumours and theories that Hitler survived the war are widespread and popular. And there are many theories about what happened with Adolf Hitler after the fall of Berlin. These are all hoaxes; not based on the facts. Some of such rumours and theories say that Hitler escaped to continue the National Socialist struggle from a different country. A particular popular version is the theory that Adolf Hitler would have escaped during the fall of Berlin in 1945 and gone to Argentina. In an interview on Deadline – Live, an Argentine news program, journalist Santiago Romero interviewed Abel Basti about Hitler’s escape, life in Patagonia, and the events that followed World War Two. Basti: “I was able to confirm the presence of Hitler in Spain thanks to a—now elderly—Jesuit priest, whose family members were friends of the National Socialist leader. And I have witnesses that allude to meetings he had with his entourage at the place where they stayed in Cantabria. Historians have generally agreed since the end of the Second World War that, staring defeat in the face, an increasingly feeble and paranoid Hitler had married Eva Braun in the bowels of his Berlin bunker after midnight on April 29, 1945, and later dictated his will. His physician Werner Haase, in response to Hitler’s questions, had recommended a dose of cyanide and a gunshot to the head as the most reliable form of suicide. Those, including valet Heinz Linge, who went into the study reported the smell of almonds, consistent with cyanide gas. They said they saw Hitler slumped on his desk with a bullet wound to his head, a pistol on the floor and blood pooling on the arm of the sofa on which Eva lay beside him with no visible sign of injury. Several witnesses said the bodies were then carried up to the emergency exit and into a small bombed-out garden behind the Chancellery where they were doused with petrol and set alight, then buried in a small crater when the Soviet shelling made it unsafe for the cremation to continue. Seven and a half hours later, Red Army troops began storming the Chancellery and the remains of Hitler, his wife and two of his dogs were said to have been discovered in a shell crater by a Soviet soldier. After the bodies were carried upstairs, Misch said: “Someone shouted to me, ‘Hurry upstairs, they’re burning the boss!’ ” But Misch decided not to go, in case the “last witnesses” were shot. He was later captured after fleeing the bunker and spent eight years in Soviet prison camps. Details of a Soviet autopsy on the remains they found, released years later, apparently showed gunshot wounds and cyanide poisoning. The remains were repeatedly buried and exhumed by Russian agents during their relocation from Berlin to a new facility at Magdeburg. There, they were put in an unmarked grave with the bodies of propaganda minister Joseph Goebbels, his wife and their six children. When the facility was due to be handed over to the East German government in 1970, the KGB, it is said, exhumed all ten bodies, burned them and threw the ashes in the river Elbe to prevent the area becoming a National Socialist shrine. They kept Hitler’s jaw and part of his skull — the fragment now thrown into doubt by US archaeologist Nick Bellantoni, who was given permission to examine the artefacts in the Russian state archive. Other discrepancies which have muddied the waters include a photo released by Soviets at the time of the fall of Berlin which purported to be the body of Hitler, shot in the forehead. It is now thought to be one of Hitler’s body doubles.